Lavish French Twists are a delicious and light snack. Perfect after a meal or with a cup of tea. Why are our Twists a great option? 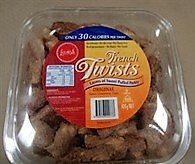 Lavish French Twists are sold nationally in Costco in 624g tubs. Ideal for parties!